The Skomer Island Blog - Weekly News and Updates: Don't Panic! "Don't panic" were the parting words of our manager, the Skomer Warden, Mr E. Stubbings as he hopped onto the Dale Princess last Friday. So re-assuring. Eddie and Bee have taken a very well deserved break to go to a friends' wedding in Norfolk. I'm not sure I envy the 8 hour train ride in the blazing September sunshine. So Jason (Assistant Warden) and I (Visitor Officer) have the island to ourselves, shared with a couple of volunteers and the odd lucky visitor. Panic hasn't set in, you'll be pleased to know. Well only a little bit as we ran out of biscuits, cake and beer, the three fuels that keep the island running smoothly. We are enjoying an amazing late summer of weather here on Skomer. Sunshine is crisping and folding the bracken, and the landing steps are baking every afternoon. The chilly mornings mean enjoying a coffee and a warm fleece as we check the ponds and willows for rarer migrant birds. We've recently had several water rails and snipe as well as shoveler and pintail on North Pond. The island has been echoing to the autumnal calls of hundreds of robins on their way south. Meanwhile every morning has given us a good passage of goldfinches, chaffinches and linnets. Although we're quiet for visitors, the daily seal pup monitoring rounds are keeping us busy. Every day we're checking all the sheltered little nooks and crannies on the island for pups. 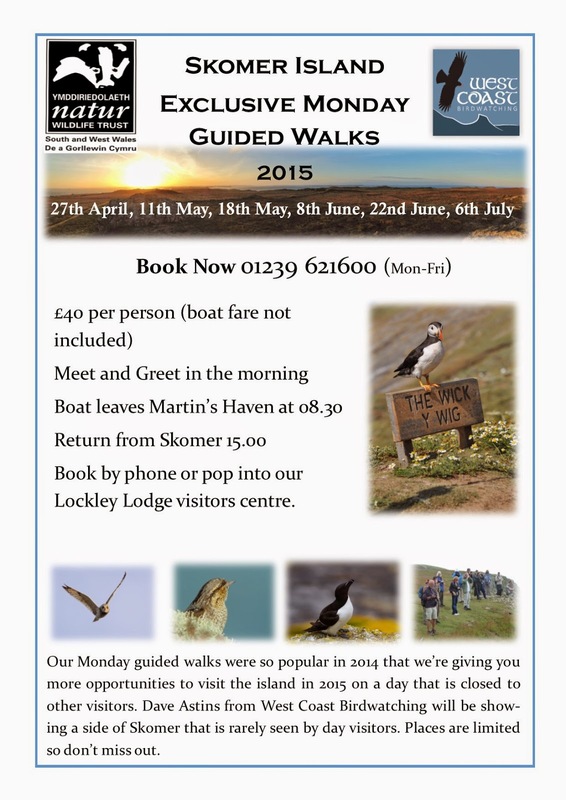 This is a nice chance to get round the island on a daily basis and to get to know our seals a bit better. We've also turned our thoughts ahead to report writing and planning for next year. We've got some more events planned for next season which I think will really help provide a more in-depth and memorable visitor experience (see the adverts). I think 2014 was a great year for visitors to Skomer, with good weather, late Puffins, and events which have never been done before. 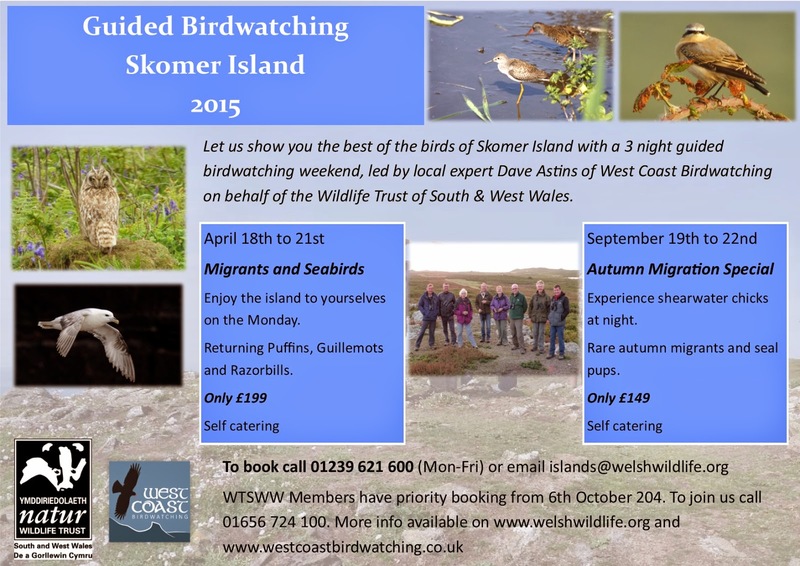 I hope we can build on our success in 2015 to really make Skomer one of the best days or nights out in Wales.